‘Wise old man, won’t you help me, please? My house is a squash and squeeze’. What can you do if your house is too small? The wise old man knows: bring in a flappy, scratchy, noisy crowd of farmyard animals. When you push them all out again, you’ll be amazed at how big your house feels! 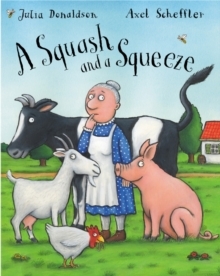 This brilliantly funny story is the first ever picture book written and illustrated by the award-winning team of Julia Donaldson and Axel Scheffler, authors of “The Gruffalo”.